An intelligent transportation system (ITS) offers considerable opportunities for increasing the safety, efficiency, and predictability of traffic flow and reducing vehicle emissions. Sensors (or detectors) enable the effective gathering of arterial and controlled-access highway information in support of automatic incident detection, active transportation and demand management, traffic-adaptive signal control, and ramp and freeway metering and dispatching of emergency response providers. As traffic flow sensors are integrated with big data sources such as connected and cooperative vehicles, and cell phones and other Bluetooth-enabled devices, more accurate and timely traffic flow information can be obtained. The book examines the roles of traffic management centers that serve cities, counties, and other regions, and the collocation issues that ensue when multiple agencies share the same space. It describes sensor applications and data requirements for several ITS strategies; sensor technologies; sensor installation, initialization, and field-testing procedures; and alternate sources of traffic flow data. The book addresses concerns related to the introduction of automated and connected vehicles, and the benefits that systems engineering and national ITS architectures in the US, Europe, Japan, and elsewhere bring to ITS. Sensor and data fusion benefits to traffic management are described, while the Bayesian and Dempster–Shafer approaches to data fusion are discussed in more detail. ITS Sensors and Architectures for Traffic Management and Connected Vehicles suits the needs of personnel in transportation institutes and highway agencies, and students in undergraduate or graduate transportation engineering courses. Lawrence A. Klein, has more than forty years experience of aerospace and traffic management experience, as a specialist in systems engineering and the development of sensors and data fusion concepts. He is a consultant and has been a research engineer, including working as Director of Advanced Technology Programs at Waveband Corporation and at the French National Institute for Transport and Safety Research. He is a Member of Transportation Research Board’s Highway Traffic Monitoring Committee and past member of the Freeway Operations Committee, and led the ASTM E17 Group V-ITS development of worldwide standards to evaluate traffic sensors. 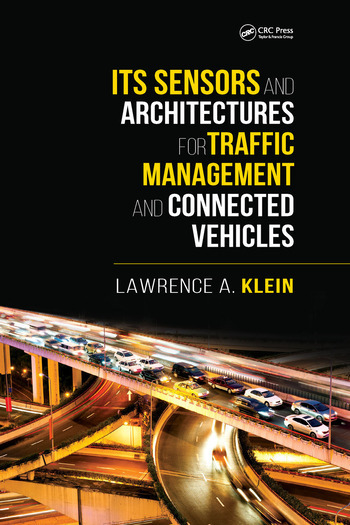 Klein is also a Visiting Professor at Harbin Institute of Technology in China, and is the principal author of the third edition of the FHWA‘s Traffic Detector Handbook. "This book covers ITS sensors comprehensively, which will be useful to ITS students and practitioners...It will be a great ITS related reference for my shelf."